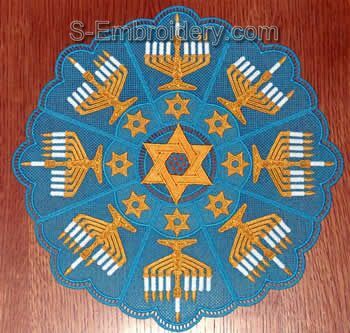 A set of freestanding lace bowl, doily and a napkin ring with Chanukah decorations. The designs will fit in a 5x7 (130 x 180 mm) hoop. 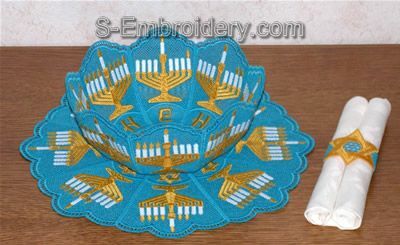 With the embroidery designs from this set you can produce 2 freestanding lace bowls and two doilies with different decorations (with letters or with the star). 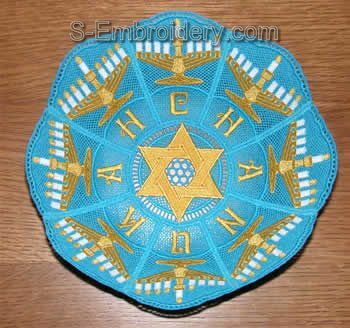 The bowl and the doily share the same star decorated bottom/center. Our delivery includes both variations of the bowl side panel and the doily side. 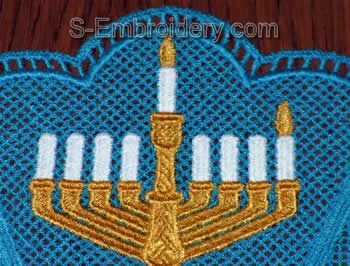 Total number of embroidery files is 34 plus an information file and a tutorial in PDF format. The panel is available in 2 versions - 1 with letters and 1 with stars. What a wonderful and thoughtful way to remember those of the Jewish faith! A thing of beauty, well done! Beautiful design! Stitches out beautifully too! More! More!